Heirlooms exquisitely tells the story of the Latour family beginning in Saint-Malo in 1939 when Lise rushes to reach her sister-in-law Esther before she dies. Lise’s twin brother Alain, Esther’s husband, is away in the war and Lise and her husband, Jean, will raise baby Eugenie until Alain can return. Lise is Jewish so when signs stating that all Jews must register within 48 hours appear, even Jean’s mother knows that Lise and Eugenie must head south. On their journey, Lise and the baby encounter the best and the worst of humanity. The words minimize certain difficulties sum up the method Lise and her fellow survivors use to deny and ignore the losses they face in order to remain resilient whether in war-time France or later as they rebuild their lives in the United States and Israel. 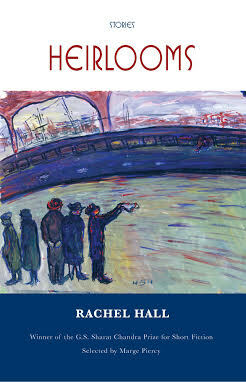 Author Rachel Hall employs interconnected stories to share the intricately woven tales of the family. The separate stories highlight each event and character with the sharpness of a scalpel. The ending sentences of each story are so brilliantly clear and pointed that one almost has to set the book down and gasp – but the next tale beckons with an almost magnetic pull. Every sentence in this book is so perfect that after the first two stories I decided that I would only allow myself a story a day. An hour later, I returned and read two more stories and by the following morning, I’d finished the book. I forgive myself for this lapse as I will have many chances to read more deliberately as this is a book I will revisit. Hall’s meticulous research inspired by her family’s wartime papers and photographs, now housed in the U S Holocaust Memorial Museum, make paragraphs like the previous one help the reader see the lives of the people she portrays. Heirlooms is a collection of stories that is so much greater than each piece. Reading Heirlooms struck me the way standing in front of Monet’s haystack paintings in the Art Institute of Chicago captures me. Monet painted several views of haystacks intended to be seen together. These separate paintings are at once dependent and independent. Hall’s stories are like Monet’s haystacks, separate works of art that are independently beautiful but that together form an entrancing mosaic leading the reader into insight about how our families and history form us. Heirlooms won the G.S. Sharat Chandra Prize for Short Fiction selected by author Marge Piercy but it won’t get much attention because it’s from a small university press, not a juggernaut of a publishing house. It will be ignored by the major newspapers and magazines and that’s understandable as I must confess that I almost skipped it. I was staring at a stack of a more than a dozen supposedly exceptional books all coming out this fall and this one didn’t have that buzz. That’s when trust came into play: the book’s publicist, the inimitable Caitlin Hamilton Summie, told me that this was a remarkable book and I knew that I should trust her judgment so I read it. Call your favorite bookstore and your local library and beg them to order this book. Summing It Up: Heirlooms is an entrancing homage to families and those displaced by war. It crystallizes the story of an extended family of Jews during World War II and after, yet it could tell the story of Cubans fifty years ago or Syrians today. Each interwoven story brilliantly highlights survival, loss, and resilience. Note: Heirlooms is an original paperback and would make a perfect stocking stuffer. When Lib Wright, a nurse trained by Florence Nightingale in the Crimea War, is hired to watch over Anna O’Donnell, an eleven-year-old girl in a remote Irish village in the 1850s, she doubts the claims of the girl and her family. Everyone in the town believes a miracle is occurring as young Anna has seemingly survived without eating for months. Tourists are flocking to the cabin to see Anna and claim some of her miracle for themselves. Lib believes in science so she knows it can’t be true. She and a nursing nun take eight-hour shifts watching Anna and neither see her taste even a morsel. The novel with its perfect evocation of the dank cabin and superstitious village is reminiscent of Hannah Kent’s Burial Rites and of Geraldine Brooks Year of Wonders. It also captures the conflict between faith and fact and the prejudices of the time against Catholics that make us look at our own biases. Donoghue, best known for her novel The Room, has long been acclaimed for her historical fiction and her skills are remarkable whatever period she illuminates. Donoghue’s story is fiction, but it’s inspired by almost fifty cases of so-called Fasting Girls, who supposedly survived without food for long periods between the sixteenth and twentieth century in Britain, Europe, and North America. Some had religious motives, others not. These girls’ stories and Donoghue’s own background growing up in Dublin where she attended Catholic convent schools infuse The Wonder with historical accuracy and a convincing feel for setting and people. With starred reviews from both Kirkus and Publishers Weekly, Donoghue once again delivers a spellbinding tale. Each of these definitions reflects what’s to come in the chapter and offer not only foreshadowing, but a glimpse into Donoghue’s creative genius. On every level – chapter titles, an engrossing story, engaging characters, and exacting language – The Wonder delivers. Summing It Up: Read The Wonder to fall into 1850s rural Ireland and what may be a miracle as a young girl seemingly goes without food for months. Join a scientifically trained nurse in her skepticism and wonder from your 21st Century perch as you feel that you’ve time-traveled to a tiny village in the middle of Ireland. The Wonder is a wonder of tension and storytelling dexterity. Yahoo and yippee! The National Book Award Finalists were announced today and News of the World, The Underground Railroad and Another Brooklyn are three of the five. I haven't yet read The Throwback Special orThe Association of Small Bombs but I commend this year's judges James English, Karen Joy Fowler, T. Geronimo Johnson, Julie Otsuka, and Jesmyn Ward (some of my favorite authors as well) for their selections. Captain Jefferson Kyle Kidd, a widowed veteran of both the War of 1812 and the recent Civil War, now 72, makes his living reading from newspapers to audiences in small northern Texas towns. When he stops to share “the news of the world” in Wichita Falls, the Captain is offered a fifty-dollar gold piece to take a ten-year-old orphan to her remaining family near San Antonio. Four years previously, Kiowa raiders had captured and raised Johanna after killing her parents and sister. Now the Kiowa realize that she isn’t worth the trouble they get from the cavalry so they sell her for fifteen Hudson Bay four-stripe blankets and a set of silver dinnerware. “Her (Indian) mother cut her arms to pieces and you could hear her crying for a mile” when the Army took the girl away. Freighter Britt Johnson, a free black man, featured in one of Jiles’ previous novels, The Color of Lightning, had been hired to transport the girl, but in Texas not everyone accepted the matter of free black men so he feared transporting a white girl and asked the Captain to take the charge. The girl remembers nothing before her life with the Kiowa, she speaks no English, and she fights all attempts to force her to act like a “civilized” child. Thus begins the tortuous, 400-mile journey the unlikely pair takes through a lawless land. Simply keeping Johanna from escaping is almost a full-time task, but the Captain must also fight opportunists, thieves, and treacherous portages while continuing to earn a living reading in the towns they reach. As they travel together, Johanna begins trusting the man she calls “Kep-dun” and their courage, tenacity, and compassion may be enough for them to survive their challenges. Johanna is the opposite of the Captain’s widowed daughter. A friend says that she’s “not one thing or another.” The skills she learned with the Kiowa prepare her for survival in a world she doesn’t wish to inhabit while her intelligence, courage, and respect for the Captain may make it possible for her to thrive there if the Captain can assure her safety. Jiles’ Enemy Women is one of my favorite historical novels EVER. I’ve loved her other novels as well, but this one may just surpass them all. It features her signature spare, eloquent words in a remarkable narrative of feats of derring-do and yet the Captain and Johanna rise above plot and prose to capture the novel and the reader’s heart. I’m flat-out flummoxed in my efforts to ascertain how Jiles managed to create two such mesmerizing characters, lead the reader through several harrowing escapades, set up a historical framework that informs as it entertain, and accomplish it all in just over two hundred pages. 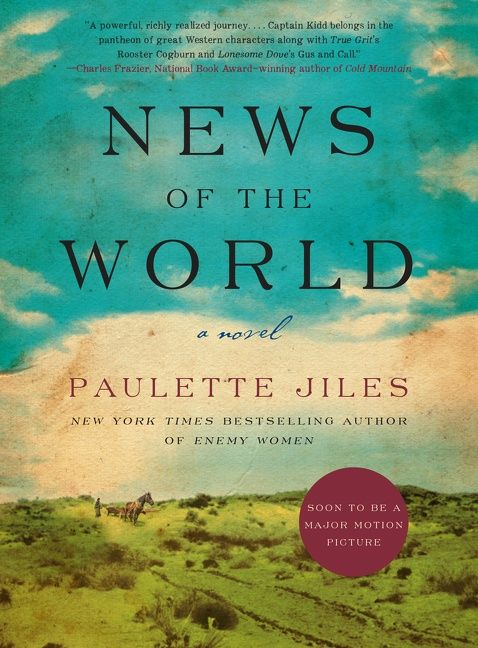 Summing It Up: News of the World is pure joy distilled into a western novel set in 1870 Texas. Jiles’ melodious prose always delights, but it’s Johanna, the 10-year-old girl captured by the Kiowa, and the Captain, who takes on the task of returning the girl to her family, that will steal your heart. Would that Paul Newman were still alive to option the book and play the Captain as this novel is destined for the big screen. Paulette Jiles is rock-solid perfect and that’s news the world needs to hear. Note: News of the World is one of the ten fiction titles longlisted for the 2016 National Book Award.